Australia completed an emphatic eight-wicket win over England to secure their fourth Women’s World T20 title. England, bidding to become double world champions, were bowled out for 105 with two balls remaining in Antigua. Australia were poor in the field but leg-spinner Georgia Wareham took 2-11 and completed a stunning run-out to restrict England. Ashleigh Gardner backed up her 3-22 with an unbeaten 33 as Australia chased down the total with 29 balls remaining. After winning the toss and opting to bat, England were unable to find any rhythm, with only Danni Wyatt (43) and captain Heather Knight reaching double figures. Despite being sloppy in the field, Australia were ruthless with the bat, as captain Meg Lanning and Gardner worked the ball around the field with ease. 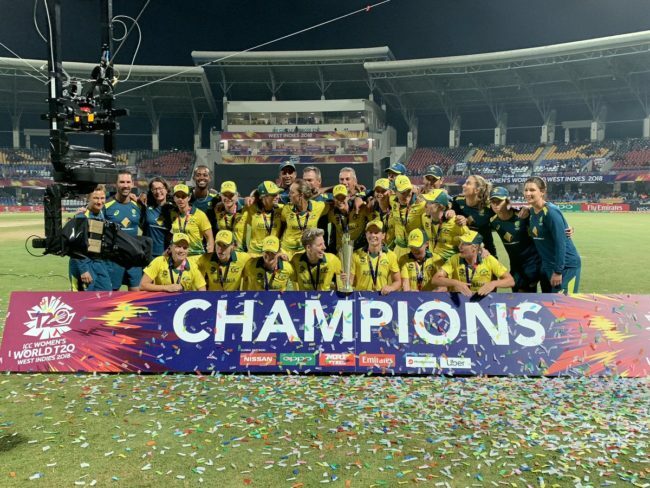 The chase looked all too easy as the match came to a close with nearly five overs to spare – with some England players left in tears as Australia celebrated their first world title in four years. England began the tournament without Katherine Brunt or Sarah Taylor – two of their most experienced players – but the performances of left-arm spinners Kirstie Gordon and Sophie Ecclestone helped them reach the final. However, their nerves at reaching a major final showed as they made a frenetic start with the bat and never really settled into the innings. In truth, England should have been dismissed for much less but Australia were sloppy in the field, with player of the tournament Alyssa Healy twice spilling chances behind the stumps. The seamers, though, excelled. Megan Schutt was economical, taking 2-13, while Ellyse Perry became only the second player to take 100 T20 international wickets as she trapped Natalie Sciver lbw. It was the teenage Wareham, the youngest member of Australia’s squad, who produced the best bit of fielding, running out the in-form Amy Jones with a direct hit from mid-on. The young leg-spinner then dismissed Lauren Winfield and Sophia Dunkley in consecutive balls as England’s middle order struggled to rotate the strike. Knight offered brief hope for England when she struck Gardner for a straight six in the 18th over, but she holed out to the next delivery with England 98-8. England were able to get over the 100 mark but two wickets fell in the final over as they failed to bat out their 20 overs. Knight’s side needed to be accurate with the ball to restrict Australia but they started badly, with Anya Shrubsole’s first over disappearing for 14 runs. Ecclestone produced a fine flighted delivery to dismiss the in-form Healy for 22, but the England bowlers were too loose at key moments. Gardner took her time to settle in but two sixes down the ground off Gordon accelerated Australia towards their target, with Lanning anchoring the chase. The final itself was not high quality but the competition – the first time the tournament has been separate from the men’s – has largely been a success, with more than 9,000 fans – around 10% of the entire population of Antigua – watching at the Sir Vivian Richards Stadium.